The E. coli outbreak linked to alfalafa sprouts from Jack and the Green Sprouts of River Falls, Wisconsin has ended with 11 sick in two states, according to the Centers fro Disease Control and Prevention (CDC). Eight people in Minnesota and three in Wisconsin were sickened. Two people were hospitalized. Located in River Falls, Wis., Jack & The Green Sprouts distributes alfalfa sprouts to states in the upper Midwest. Those sickened purchased the contaminated sprouts at a variety of locations including grocery stores, restaurants, salad bars and from commercial food service operations. A recall was issued for the sprouts. Health officials used DNA “fingerprinting” to identify cases of people infected with the outbreak strain of E.coli O157:H7 Case patients who ranged in age from 17 years to 84, with a median age of 28, reported onset of illness dates ranging from January 17, 2016 to February 17, 2016. 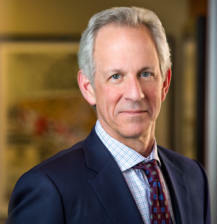 Attorney Fred Pritzker has represented people who have been sickened by sprouts contaminated with E. coli, Salmonella and other pathogens. He can be reached at 1-888-377-8900. In Minnesota, about 150 cases of E. coli O157 are reported each year. Symptoms of an E. coli O157 infection include stomach cramps and diarrhea, that is sometimes bloody. Sometimes these symptoms are accompanied by a low-grade fever. Onset of illness usually occurs two to five days after exposure to contaminated food and lasts a week to 10 days. Some people with E. coli infections develop serious complications including hemolytic uremic syndrome (HUS) which leads to kidney failure. No one who was part of this outbreak developed HUS. Diarrhea associated with E. coli O157 infections should not be treated with antibiotics, as this can increase the risk of developing HUS. Anyone who ate the sprouts and has symptoms of an E. coli O157 infection should contact their health care provider and mention exposure to E. coli through these sprouts. Sprouts are a common source of foodborne illness Since 1996, there have been more than 40 “sproutbreaks,” or outbreaks of illness linked to sprouts contaminated with Salmonella, Listeria, E. coli and other pathogens. Because of the damp environment required to grow sprouts it is difficult to control for bacteria. 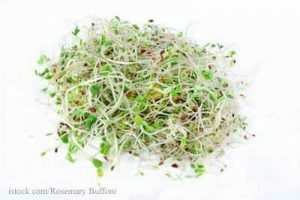 The Centers for Disease Control and Prevention (CDC) recommends that children, seniors, pregnant women, and those with weakened immune systems avoid eating raw sprouts of any kind and that others thoroughly cook sprouts before eating them.